Our MicroShowers are specially designed to be effective, even when they are operated at the relatively low water pressure that is typically found in UK households. We have tested hundreds of different designs of spray heads in order to be able to create Whoosh designs that have the optimum functional effect. Whoosh MicroShowers create small high velocity droplets which have great cleanability while using a minimum of water. Our Whoosh MicroShowers are ergonomically designed for maximum convenience. The on/off switch is located on the same side as the nozzle and the nozzle is at the optimum angle. Whoosh MicroShowers are designed to light weight for everyone to be able to use them easily. Unlike traditional designs Whoosh MicroShowers cannot be forced to stay on and thus any possible health risk from potential backflow situations is eliminated. Our MicroShowers are made to our exacting standards from tightly specified materials and rigorously tested to ensure that they give 100% drip free shut off. Our reinforced chrome effect hoses are polymer sheathed to provide the ultimate in hygienic cleanability. 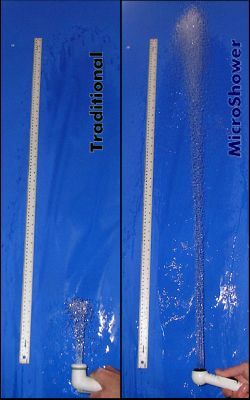 Traditional metal crimped shower hoses are not suitable for use with MicroShowers. MicroShower heads can be easily replaced if they their performance starts to be impaired, as can happen in very hard water areas for example. Our specially designed MicroShowers have a flow of 3 to 4 litre/min (with 3m head of water pressure) and effectively perform their function with a 5 to 15 second duration spray, resulting in a consumption of 0.25 to 1 litre. People who suffer from diarrhoea or sticky faeces commonly use more than a dozen sheets toilet paper in a fruitless attempt to get clean, which normally requires at least a second flush to dispose of. With a MicroShower one sheet of toilet paper is sufficient because it is only used for drying. This means that often the 6 litre second flush is saved The consumption of paper is also reduced with corresponding water consumption and environmental benefits. Furthermore, the MicroShower consumption is much less than a traditional bath or shower, or even the flow from a tap necessary to wet and rinse a flannel.